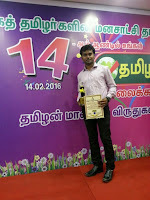 I deem it a great pleasure to congratulate Mr. S. Dinesh , a final year student of Mechanical Engineering, for being awarded the 'Best Student Sportsman Award - 2015' by the Tamilan Television [Tamilan Kalaikoodam (P) Ltd]. 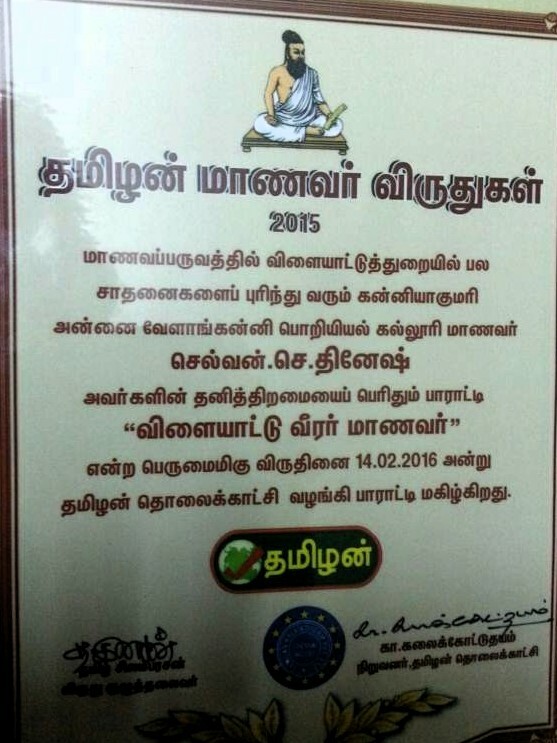 The Award was conferred by Mr. Kalaikotudhayam, the Founder and Managing Director of Tamilan Television on 14th Ferbruary, 2016, in the Tamilan Television office. The student is highly active in the academic as well as extra curricular activities. At present, he is on an internship in Bharat Heavy Electricals Limited (BHEL), Ranipet. Moreover, he is also involved in various projects carried out in our College. On behalf of our Management, Principal, Staff and Students, I congratulate him on his well-deserved success and wish him all the very best.